Highfields State School commemorated ANZAC Day through a school service on Monday 24 April. From August 2014 until 2018, we commemorate the centenary of the First World War. The events that took place 100 years ago meant a lot to us then and mean a lot for our future. The school captains together with Mr Lyndon McIntyre followed the traditional order of service for a commemorative ceremony. Our official guests included Warrant Officer Class 2 Tony Jenner (Army), Sergeant Dustin Waugh (Army), Chief Petty Officer Aircrewman Steven Smith (Navy), Squadron Leader Adam Luck (Airforce), Corporal Garth Cummings (Airforce) and Councillor Nancy Sommerfield. Squadron Leader Adam Luck delivered a commemorative address defining the ANZAC spirit. Chief Petty Officer Aircrewman Steven Smith recited the Ode, which is the fourth stanza of ‘For the Fallen’, a poem written by the English poet and writer Laurence Binyon. We were also privileged to have Michael West-McInnes fascinate us with the unique sound of the bag pipes and Caroline Ryan (Music teacher) play the bugle. 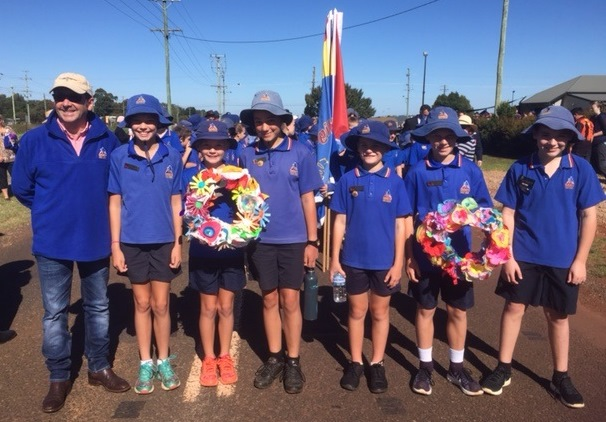 On Tuesday 25 April, approximately 50 students from Highfields State School participated in the ANZAC Day march through the main streets of Highfields and attended the service at the Cultural Centre. Members of our senior choir combined with students from other local schools to sing the National Anthem and Amazing Grace. The senior students supported Highfields State School in their leadership role with pride. Thank you to attending teachers and parents for assisting all our students to represent Highfields State School.